Deb's Cup of Tea: It's about perspective. I was listening to WCDB on the way home from work last night. Brian O'Keefe was delivering the news. The Cubs lost but the White Sox won so there was a discussion of whether the glass was half-full or half-empty. Mr. O'Keefe had a very interesting take on that discussion. "I don't see it as half-full or half-empty. It's about the size of your glass." That is quite profound. I hadn't looked at things from that perspective. But, it ties in with what I contemplated earlier. It really isn't about whether the glass is full or empty. It's about your perception of it. You could have all the things in the world and still be woefully unhappy because you perceive your cup as empty. 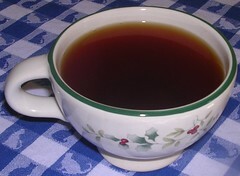 8 ounces of tea overflows a 6 ounce cup and doesn't fill a 16 ounce glass. Learning to be content. That's what it's about. Learning to see that what I have is enough for what I need. It's about seeing that the cup I have is full. Occasionally, it won't be. That's just how life is. But it is full most of the time and I am learning to be happy with that.